Is it over price kit? Can I get the same results sourcing all the parts my self? I don't mind paying a little over the odds for the convenience of it all coming in one pack with a step by step guide. Nope. Buy your own parts piecemeal. If you're serious about building a VSR or something, then use these forums and read all the stickies etc. There are so many things you can do to BASRs these days that I doubt anyone here would cover them in one post (or even thread) so it's worth flicking through the pages of collective knowledge that are on there. Thanks prof as always you are trully wise. What should one spend upgrading? I know the sky is the limit my m4 is proof but just looking for a ball park. £200 on top of the price of the gun? FYI if anyone has a tm vsr for sale pm me. It really depends on what you're comfortable with, but I'd say no less than £200. Ideally about £300 once all is said and done. You could go for a JG BAR as that'll save on the cost of the base gun if you're going to be stripping it all out anyway. And, as always, look at the Mancraft SDiK too; those things are great and ultimately not as expensive as you may think because a lot of the things you'd usually upgrade in a spring-powered rifle (trigger, cylinder, guide, spring, piston etc.) just don't need to be once one of those is in there. I think at the >£300 mark you're probably looking at external changes. I dumped some money on a silly PDI trigger guard, barrel and the like, but to get something shooting as well as anything else out there I'd say £300 is a fair estimate. I mean one can easily put £150+ into an optic. Bore up barrel, nicer receiver, rail etc. - I don't think I'd have trouble putting £600-700 into a VSR if I wanted all the bells and whistles. Just to confirm I am looking at the right thing, the SDiK is a gas conversion kit? If so, and I know this might sound a strainge question but do you still have to use the bolt? Yeh, it is. Can run off CO2 with their adapter or HPA bottles. I managed to fit my regulator and CO2 bulb into the stock so it's completely streamlined. Shizbazki did a similar thing with one of those rifle stock bag/cheek rest thingies and his looks pretty good too. If I couldn't hide it away I'd have thought twice, but the benefits of having a shorter, lighter pull with adjustable and consistent fps (also a slightly quieter bolt) were worth the effort of modifying my stock and - like I say - you wouldn't know it was CO2 powered from the outside. You still use the bolt. The whole unit slides into your existing/stock cylinder and you remove the spring, spring guide and stock nozzle from the gun. The air/CO2 line runs down through the trigger mechanism and out through the back of the stock. Here's my current build. Need to detail the hop bit but only just got the material for the R-hop patch and need to fit it. Prof that looks great and defo the way am goin to go. I've just order 2 c02 pistols coz am sick of green gas. So bulbs will do for everything. Just a quick one prof, once the kit is fitted and I replace the hop, bucking and barrel is there anything else to replace (internally) for extra performance? Open question, if this kit is available for what seems to be a 50-25% of the cost that some people are talking of dropping into the vsr. Why are people spending so much? Is there somthing I am missing? Because either people don't do their research properly or they have more money than sense. I don't see any reason why you need to replace everything in a sniper rifle just to use higher fps springs when you can save hundreds by buying a Mancraft kit. Anyone that buys the 'upgrade kits' from Novritsch are IDIOTS. Like Monty says: The same reason people buy any of the Dre Beats products: Good advertising and a solid brand. Most people in airsoft know who Novritsch is, and he absolutely knows that too - anyone with half a brain cell would apply their brand to a product which can make them money. Unfortunately that margin is too high. The kits are good, but they're not the best you can buy. Companies like LayLax, PDI and Airsoft Pro have been working on the VSR platform for years and years now - they know what they're doing and between them they're the best you can buy. For an SDiK build you've basically covered it. Long story (fairly) short: In really any airsoft build (but particularly a sniper rifle) you need consistency. If you can be precise then you can be accurate: Most builds tacle this through a decent spring, good hop seal, a better piston with a decent seal etc. The SDiK cuts all of that out and just uses regulated CO2 but ultimately it is - like Shizbazki says in his video - just another power source. So yes, you need a good hop unit and a good barrel. You'll also want decent spacers and you'll want to spend time looking into how to set you hop correctly - the TDC mod is something you can research, but there are a whole host of buckings out there like Firefly, Maple Leaf, Prometheus or even an R-hop patch that will give you consistent lift on your BB allowing you to hit the same spot every time. The only other thing I'd put money in to is a good scope. Visionking are great - I've owned 3 of their optics now and they're clear and very well built. They are expensive, but much cheaper than some of the real-steel stuff. You can get their stuff between £70-100 and have a excellent scope with a clear reticule, variable zoom, lockable turrets and a clear picture too. For PDI stuff http://www.x-fire.org/e.index.htm is your best bet. Be wary of VAT. If you don't go with an SDiK you need to consider cylinder, cylinder head/nozzle, piston, springs and spring guides plus possibly a 90o trigger mech. It's partly preference to be fair, some people aren't keen on HPA and some sites blanket ban CO2. I agree Novritsch stuff is a waste of a money though, I like his videos but he quite heftily marks up the parts he sells. Oh yeh, but I think most sites ban CO2 because it's not properly regulated. I know a few sites that let certain CO2, but like you say some blanket-ban it with good reason - people just can't be trusted with those cheapo handguns and the like. I guess the semi-solution would be a 13ci HPA tank. Costs about £30 and will do a whole day pretty easily. Still annoying though. By the way, I would like to say you can get springers shooting just as well as an SDiK. The only reason I'm such a proponent of it on a new rifle build is because of not needing a new trigger, and the benefits of adjustable ft/s along with the shorter pull and slightly quieter operation. I wouldn't switch to SDiK from spring for the small benefits it brings if I already had a springer that I didn't want to sell on first. Prof and monty as always you have been most helpful. Already looking to order a tm vsr. Defo they way am goin to go. 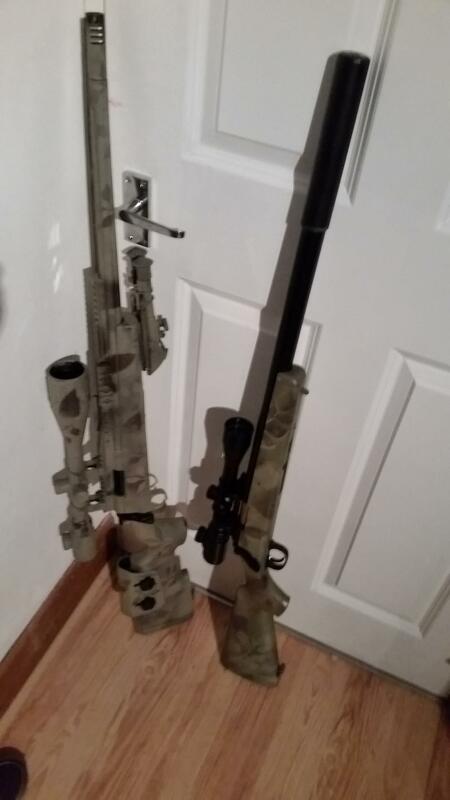 Am sure I could post on a sniper specific forum but I'd get endless answer about the most minuet details. That's one of the reasons I like this forum, clear to the point answers and no b*llox. Am not really to bothered about upgrading the external parts. I've never been one for tacticool. I just want somethin that will shoot true 98% of the time. Seems like this is just on the edge of my tech skill so it's somthin I am goin to do myself. There my be follow up questions (and pics of a disasembled gun) lol. Will have to dig the small labelled bags out for all the small parts to go into. If you're upgrading it you may want to get a cheaper VSR clone like the JG. Obviously the hop is decent out of the box with the TM, but it's not as good as some of the aftermarket options. This thread is awesome, can we get a better title please! Just back the the quiz. Hef, ur using a 6.03. And am sure prof said the same, is there a reason for that as apose to a 6.01. If it is Bb related issues I get it but just wondering if there is a more machanical reason. BBs stabilise better in wider bores. More consistent hop. Do you find a 6.03 is the optimum bore? Only playing cqb although I've done mods I don't really see the "full" benefit.